I didn't blog about it enough, but 2015 was my year of magical training. 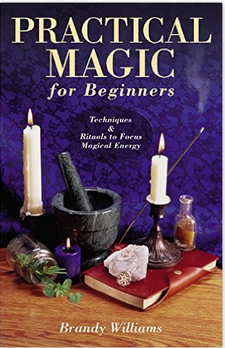 If there is one thing I learned, magick and Energy Healing are not that different. Both involve directing Earth or Universal Energies for a specific purpose. With healing the focus is on restoring balance to the mind, body and spirit. Magic can accomplish this too, whether we use crystals, candles or words to quantify our intent. As a matter of fact, I'm now a huge fan of charging crystals with specific purposes and taking them with me everywhere I go. We can program a crystal with what I would call an external goal, for example: to manifest a book deal, find a new home or a new job, etc. But I find it much more interesting to work magick on ourselves, transforming our own energy so we can become the best possible version of ourselves. I also discovered that we can work with our natal charts to facilitate the process, filling in the blanks with a magical talismans. For example, I have virtually no water or fire in my chart. If you have read my post, Healing with Astrology, you'll know that all four elements are vital. Ideally we'll have an even mix, though many of us are astrologically lopsided. Magick and healing can help us find that balance. What I enjoyed most were the daily rituals and meditations. Nothing too elaborate, a small altar with a candle, a crystal to represent the element of Earth, a silver bowl with Water, a chopstick wand to represent Fire and finally, a pen to represent the element of Air. I know we are supposed to use a ceremonial knife but as a writer, I felt that we need more pens and fewer weapons. Not to mention the fact that the element of Air is linked to thought, logic, writing, learning, etc. The rituals I practiced were limited to connecting with the planets, the angels and the Ascended Masters, same as I have always done, so the protective circle was all I needed to keep the space clear and safe. In Psychic School we learned to protect ourselves and our space with a grounding roots and a circle of light. If you're working with planetary magic, I find the Lesser Banishing Ritual of the Pentagram to be more appropriate, as the five points represent Earth, Air, Fire, Water and Spirit, and these can also be traced back to the planets and the zodiac signs that we want to interact with. 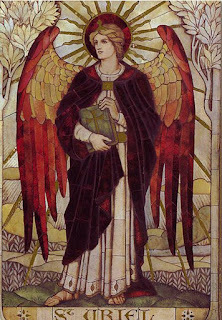 The LBRP also involves some of my favorite Archangels - Michael, Raphael, Gabriel and Uriel - calling on their lovely energy to protect the space. I read a ton of books this year, practicing the techniques that resonated, mainly those related to Archangels, Planets, and the Kabbalistic Tree of Life. In no particular order, these were some of my favorites. I think it's time I wrote a book on Healing, Magick, Planets and maybe Angels. Sounds like fun! A Few Books of Occult Philosophy, by Cornelius Agrippa. Tarot and Astrology, by Corrine Kenner. If I had to choose, the coolest thing that I have discovered the past year has been Astral Projection and how we can use it to travel through the Tree of Life (see here). So that was my recap for 2015! I am not done learning but it's time to greet the New Year with a new project, one that is long overdue. 2016 is going to be the year that I finally go green. It has been a while since I expanded my definition of healing to include our relationship with the planet and I am afraid to say I don't know where the "big wins" are. What can we do as individuals to help, and where do we need urgent intervention by governments? This next year I am going to make it my business to learn about Sustainability.